Work groups at Technische Universität München (TUM) under Prof. Peter Schieberle and at the University of Vienna under Prof. Veronika Somoza studied four different edible fats and oils: Lard, butterfat, rapeseed oil and olive oil.Over a period of three months, the study participants ate 500 grams of low-fat yoghurt enriched with one of the four fats or oils every day -- as a supplement to their normal diet. "The findings surprised us," admits Schieberle, "because rapeseed oil and olive oil contain similar fatty acids." The researchers decided to turn their attention to a completely different type of substance -- the aroma compounds in olive oil.In the second part of the study, one group was given yoghurt with olive oil aroma extracts and a control group was given plain yoghurt.The results were conclusive: The olive oil group's calorie intake remained the same, but the control group had been consuming an extra 176 kilocalories per day. Schieberle explains: "The aroma group adapted their eating habits -- but the control group participants were obviously not able to do likewise. We also found that in comparison to the other group, the control group had less of the satiety hormone serotonin in their blood." The researchers used olive oils from Spain, Greece, Italy and Australia for their study. The research team managed to identify two substances that reduce the absorption of glucose from the blood in liver cells: Hexanal and E2-Hexenal. They also discovered that Italian olive oil contained larger amounts of the two aroma compounds. Fatty acid profile, tocopherol, squalene and phytosterol content of walnuts,almonds, peanuts, hazelnuts and the macadamia nut. 1: Int J Food Sci Nutr. 2004 May;55(3):171-8. Maguire LS, O'Sullivan SM, Galvin K, O'Connor TP, O'Brien NM. Department of Food and Nutritional Sciences, University College Cork, Ireland. Nuts are high in fat but have a fatty acid profile that may be beneficial in relation to risk of coronary heart disease. Nuts also contain other potentially cardioprotective constituents including phytosterols, tocopherols and squalene. In the present study, the total oil content, peroxide value, composition of fatty acids, tocopherols, phytosterols and squalene content were determined in the oil extracted from freshly ground walnuts, almonds, peanuts, hazelnuts and the macadamia nut. The total oil content of the nuts ranged from 37.9 to 59.2%, while the peroxide values ranged from 0.19 to 0.43 meq O2/kg oil. The main monounsaturated fatty acid was oleic acid (C18:1) with substantial levels of palmitoleic acid (C16:1) present in the macadamia nut. The main polyunsaturated fatty acids present were linoleic acid (C18:2) and linolenic acid (C18:3). alpha-Tocopherol was the most prevalent tocopherol except in walnuts. The levels of squalene detected ranged from 9.4 to 186.4 microg/g. beta-Sitosterol was the most abundant sterol, ranging in concentration from 991.2 to 2071.7 microg/g oil. Campesterol and stigmasterol were also present in significant concentrations. Our data indicate that all five nuts are a good source of monounsaturated fatty acid, tocopherols, squalene and phytosterols. For soapmaking, we recommend jojoba oil. Over time the use of Jojoba oil significantly changes the appearance of pore size and moisturizes the skin. It also makes a great makeup base. Jojoba oil has some amazing properties since it is suitable for all skin types and penetrates the skin readily and for this reason is frequently used in skincare and cosmetic products. Jojoba - the miracle oil for softening the skin is used to promote a softer more supple skin, while being non-greasy. Jojoba oil is easily absorbed by the skin and is great to promote a silky smooth skin. Jojoba oil will help to nourish the skin and prevent dryness. A fine penetrating odourless oil which has the consistency of a liquid wax. Jojoba Oil is stable and long lasting. It is a good conditioner for all skin types, especially mature skins. Jojoba is also effective for dryness and dandruf and can be massaged on its own into the hair and scalp. The best choice to use as a perfume base because it is the least greasy of the carrier oils. In reality Jojoba oil is not an oil but a liquid wax, and is pronounced "ho-ho-ba", and only became important in the 1970s when whaling was banned, since Jojoba oil has almost the same properties as the oil obtained from the sperm whale. Since Jojoba oil is composed of wax esters, it is an extremely stable substance and does not easily deteriorate. The structure of jojoba oil closely resembles that of your own skin sebum, and because of this it has a natural affinity to the skin, and is readily absorbed without making the skin feel greasy or tacky nor does it clog the pores and helps to balance the production of sebum - your skin's own lubricating medium. A typical chemical analysis of jojoba oil includes palmitic, palmitoleic, stearic, oleic, linoleic, linolenic, and arachidic, eicosenoic, behenic, and erucic and lignoceric fatty acids. It contains myristic acid which also has an anti-inflammatory action. Jojoba oil has the ability to minimize fine lines and wrinkles, promoting skin suppleness while assisting with the rejuvenation of the skin and forms a non-greasy, non-tacky layer with exceptional trans-epidermal water control. Jojoba oil is well tolerated by people with skin problems and does not aggravate acne, and also helps to break down sebum in plugged-up pores. In dermatological tests done, using jojoba oil, by Christensen and Packman, it was shown that jojoba oil increases the skin's suppleness by 45% and after 8 hours the effect was still present.It was also found that jojoba oil softens and smoothes the skin with fine line reduction. In one test 20 women's skin compliance increased with 37% after 30 minutes and remained for a hour.Continued use of jojoba oil results in reducing superficial facial lines. Reduction of such lines was 26%, 18% and 11% after 1, 4 and 8 hours in conducted tests. 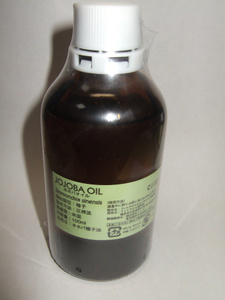 Jojoba oil was also tested for hypoallergenic reactions. Two out of 50 people with known allergic skin types showed reactions to Jojoba. This reaction on the inherently hyper-allergic skins cleared completely after 24 hours. Pure Jojoba Oil can be used to assist in fighting wrinkles and extra dry and old skin as well as skin plagued with many other ailments or problems. It assists in minimizing lines and wrinkles and will actually help rejuvenating the skin and new cell growth as well sorting out problem skin, without clogging the skin with greasy mess. It is suspected that jojoba oil "tricks" the skin into stopping the production of sebum through somehow mimicking sebum. This also means that jojoba oil will assist in breaking down sebum in plugged-up pores. Sebum and jojoba oil will mix readily without sealing off the skin pores. Dermatologists have also reported jojoba oil's non-irritating use for acne. Other materials such as mineral oil can cause anaerobic microbial growth and inflammation redness and swelling in and around pores. Jojoba oil will not cause blackheads that contribute to acne. As a result jojoba oil and sebum will form a non-greasy, non-tacky layer with exceptional trans-epidermal water control. How great, jojoba oil will therefore assist in fighting wrinkles as well as dry, or oily skin. Sperm whale oil was used for decades as an oil for fighting wrinkles. Jojoba oil is composed of liquid wax esters which makes up 25 - 30% of our skin's surface layer called sebum. As we age our rate of wax esters production steadily decreases, particularly in women. It has been reported that jojoba oil also has the ability to retard sebum excretion in people with oily skins. Professor Zille of Port Elizabeth University carried out further studies on the anti-bacterial effects of jojoba oil and the results were presented at a Coshem Congress held at Mintek. Tests at Michigan University showed that five of the most common skin bacteria plus certain skin fungi couldn't survive in jojoba oil. Studies on jojoba oil at the University of Michigan supports the conclusion that 5 of the most common bacteria, including staphylococcus aureus and pseudomonas aeruginosus as well as the fungus candida albicans were not capable of growing in jojoba oil. The medicinal working of jojoba oil was studied at the Pharmaceutical Department at the University of Port Elizabeth and found that jojoba oil destroys the bacteria staphylococcus and pseudomonas within 1 hour and 15 minutes. Studies on jojoba oil at the Ben Gurion University in Israel have shown that jojoba oil relieves the symptoms of psoriases.